Well, given about 100 or so views and with only one comment which was positive (thanks, callum91, by the way), I assume that this is good enough to upload. The request was a male cheerleading outfit that matched the blue and white cheerleading outfit, with the specification of blue pants; however, I got carried away and did much more. 1. 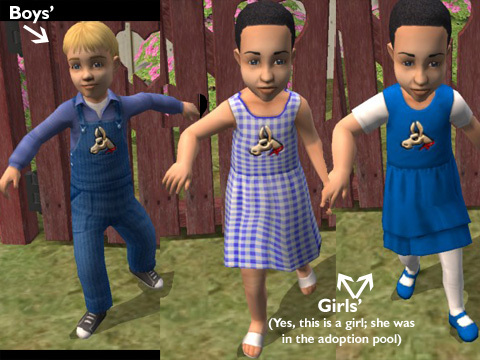 The requested outfit in all categories for both Young Adult and Adult. 2. Another version of the requested outfit (not with blue pants) also for all categories for Young Adult and Adult. 3. Two versions of Toddler tees for both genders: one with "Little Llama/Big Spirit" on front and one without. Both have "Vo Gerbits!" (Simlish for "Go Llamas!") on the back. All Categories. 4. 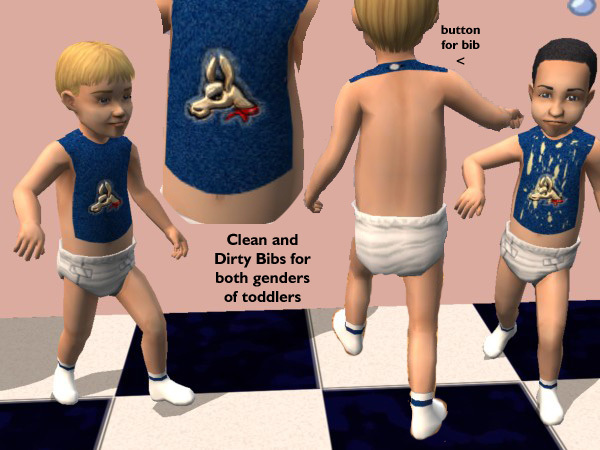 Two versions of a bib for toddlers of both genders: one that is clean and one that has been splattered with food. Just in the "Everyday" category. 5. Three gender-specific Toddler clothes for the "Everyday" category. 6. Sweats for both genders and for Young Adult and Adult with an altered version for Elders. These come in two versions: one with and one without "Vo Gerbits!" on the back. 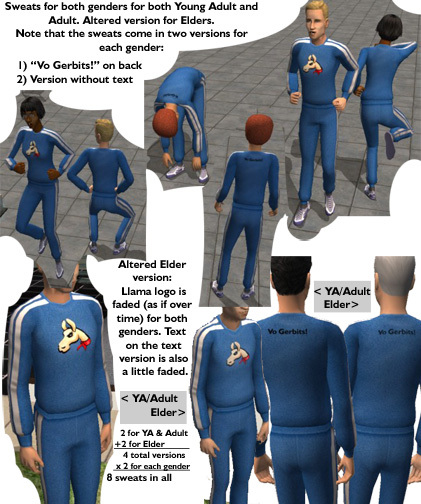 The Elder versions are exactly the same except that the Llama logo as well as the optional text is faded as if they have faded over the years since college. The text is not as faded as the logo. Unless my math and counting are wrong, 2 versions for Young Adults/Adults and 2 versions for Elders for each gender means that there are 8 sweats in all. These show up in the "Everyday" and "Athletic" categories. 6. 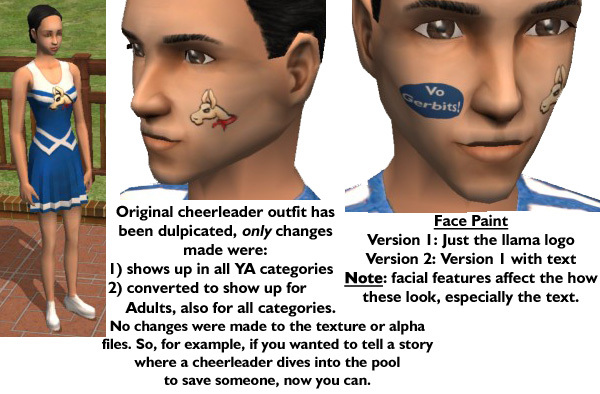 Face paint in two versions for all genders and ages: one with just the llama logo and one with "Vo Gerbits!" as well. Note: facial features affect the way these look, especially the text. 7. 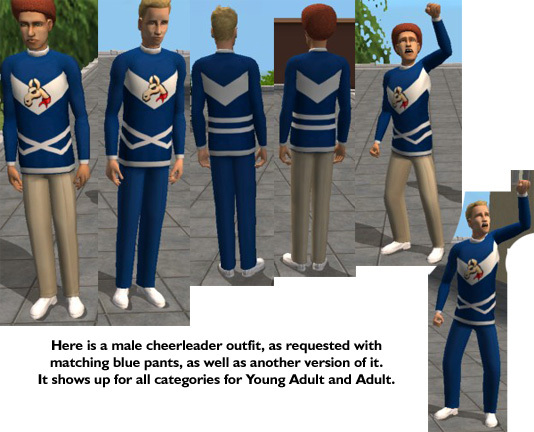 The original cheerleader outfit converted to all categories for Young Adult as well as Adult. This is for anyone's story purposes (I gave an example in the picture). There are 22 files in all. No new meshes other than what came in the original and University. I have Nightlife, but I don't think it matters with these. I apologize for the delay to anyone who was waiting for this. 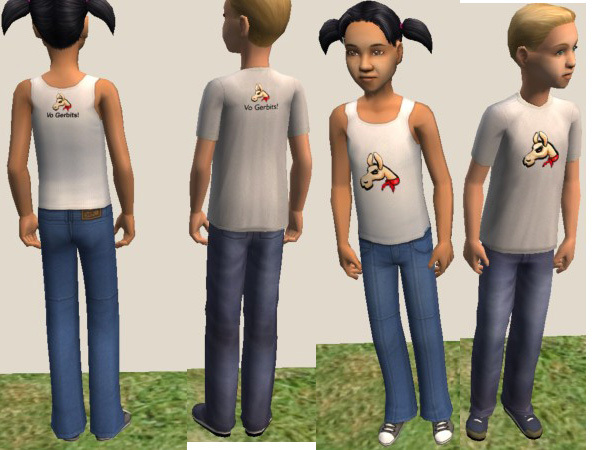 I'd like to thank LyricLee for allowing me to recolor the toddler tees. I realize that I'm not the best creator here, so I will allow anyone to improve these as long as it is posted here and you give me some credit. If you'd like to make more clothes like this and expand this Set, go right ahead. Please do not redistribute these. Edit: I forgot to mention that I included two "Everyday" children outfits. They're nothing too special, but I did add a little texture to them. They should have been already included in this set; you should not need to download this again to get them. 108 people have said thanks to maybesomethingdunno for this download. -That's Just Ducky- 24 Swimsuits for your Tots!